[Eng] Hello there, I'm Liars-Syndrome! You can call me Blair or Syndrome if you'd like I tend to be a bit anti-social so please don't be worried if I don't respond to you comments right away. 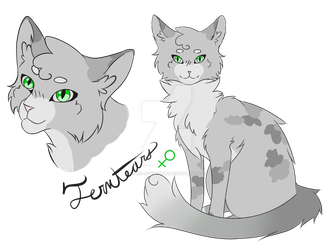 I've recently gotten back into warrior cats, which I used to really love when I was younger, and even have my own comic planned. I make my art using my Huion tablet, but I hope to get a Cintiq, or similar. Although I love to draw I have a tendancy to procrastionate even that. I'm learning Spanish, but if I make any mistakes please correct me That also means I'll have to work around what I don't know how to say, so translations may have slightly different things. [Esp] ¡Hola, me llamo Liars-Syndrome! Si quiere, me puede llamar Blair o Síndrome Me suelo ser un poco insociable, así que por favor no esta preoccupied si no respondo a sus comentarios inmediatamente. Recientemente, yo empiezo leer Los Gatos Guerreros, que yo encantaba cuando era una niña. Tambien, yo tengo un tira cómica planificado. Yo dibujo con mi tableta de Huion, pero yo quiero una tableta de Cintiq. Aunque yo amo dibujar, me suelo procrastinar. Mi idioma primero es inglés, por lo que por favor me correge cuando hago errores. ¡Gracias! Check out my friend, Mica! She's super sweet and deserves love~! Omg!! your icon is the sweeetest thing ever! seriously catched my eye inmediatly i love the combination of the mynt colour with the black clothing who made it? Happy birthday! sorry if this is early but time in different countries makes it odd ^^' I really hope you continue with your work and if you need anything from me just ask again Happy birthday, I hope it's great! Hello! I was looking at your lovely art and saw you were interested in warriors! There are a few high rankings still open so if you're interested, you should contact the group asap. Have an amazing day!